South Korea’s relationships with China and the United States make for tricky diplomacy. When the South Korean and U.S. presidents met Friday in Washington, D.C. for their second summit since entering office, they touted the strength of their countries’ relationship, the centerpiece of which is their decades-old security alliance. But the meeting between Park Geun-hye and Barack Obama also inadvertently (but inevitably) drew attention to an increasingly fine balancing act being performed by South Korea: managing close U.S. ties in tandem with its growing relationship with an ascendant China. While the U.S. remains South Korea’s security guarantor, stationing some 28,500 American troops in the country, China is its largest trading partner. In a sign of Seoul’s increasingly warm relations with Beijing, Park has held no fewer than six summits with Chinese President Xi Jinping since coming to power in 2013. Park’s visit to the White House came just a month after she attended a military parade in Beijing to mark the 70th anniversary of Japan’s defeat in WWII — an event shunned by the U.S. and other democracies. Washington reportedly objected to Park’s presence at the celebrations, concerned it would send ominous signals about their alliance. While North Korea may remain “at the top of the agenda” for U.S.-Korea talks, as U.S. officials have insisted to media, Northeast Asia’s shifting geopolitical dynamic was also bound to feature in the discussion. 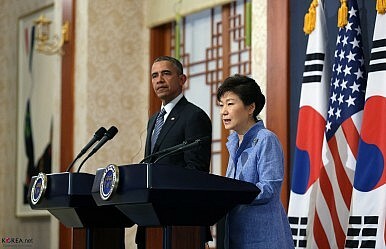 Ahn Se Hyun, a professor of international relations at University of Seoul, told The Diplomat that, from the start, Park’s administration has struggled to maintain Washington affections while wooing Beijing. One of many potential points of friction is THAAD, a U.S.-developed missile defense system that could be deployed in South Korea as a counter to North Korea’s missile arsenal. Last year, the commander of U.S. Forces Korea, Gen. Curtis Scaparrotti, pointed to THAAD as a logical choice to bolster Seoul’s defenses, prompting strong protestations from Beijing. The missile defense system’s radar has a range of more than 1,000 km, bringing parts of China and Russia within reach.